Does Low-Dose Intravenous Methylprednisolone Pulse Therapy Produce Unacceptable Adverse Effects in Children? 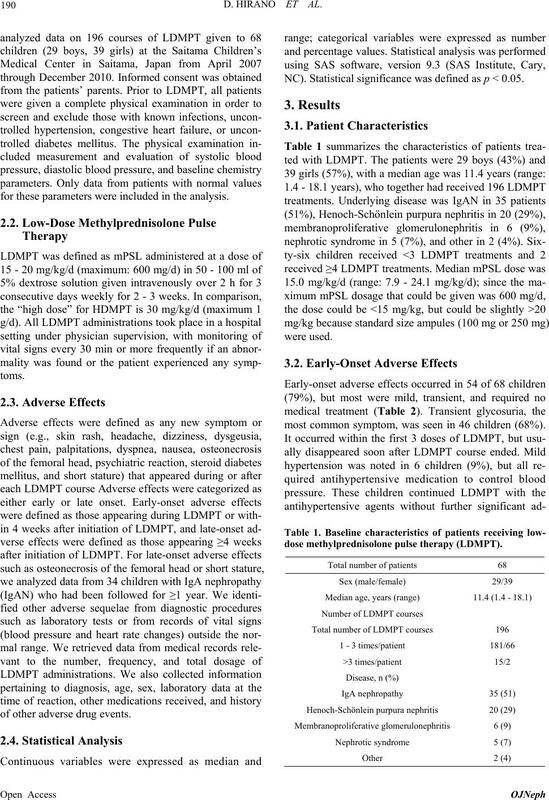 ciated with LDMPT in pediatric patients. *The authors have no conflicts of interest to declare. for these parameters were included in the analysis. of other adverse drug events. NC). Statistical significance was defined as p < 0.05.
most common symptom, was seen in 46 children (68%). dose methylprednisolone pulse ther apy (LDMP T). found no documented case of osteonecrosis. differ between adults and children. children with rheumatic disease, Klein-Gitelman et al. maximum 30 mg/d) on alternate days after LDMPT. The minimum effective dose of mPSL is unclear. dosages and mechanisms of action of MPT. that we did not miss any serious treatment complications. diatric patients with various glomerular diseases. ing and after low-dose methylprednisolone pulse therapy. E. S. Cathcart, B. A. Idelson, M. A. Scheinberg and W. G.
The Lancet, Vol. 307, No. 7952, 1976, pp. 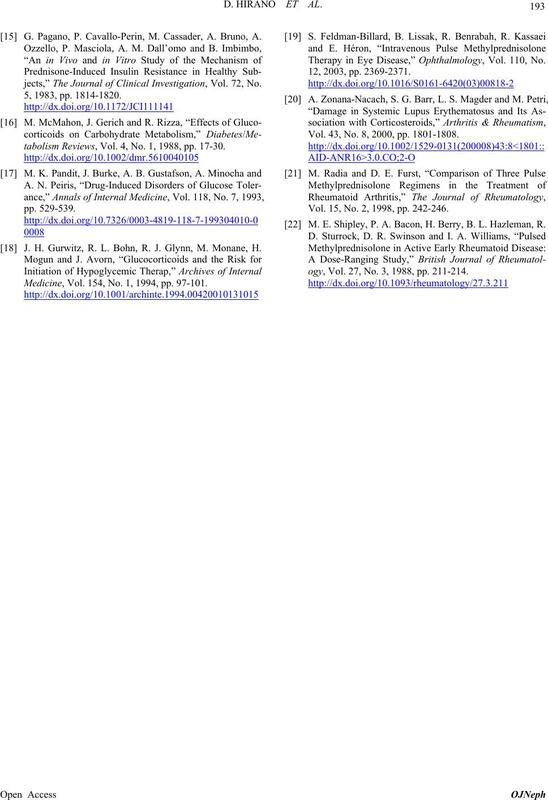 163-166.
dian Journal of Pediatrics, Vol. 75, No. 10, 2008, pp. 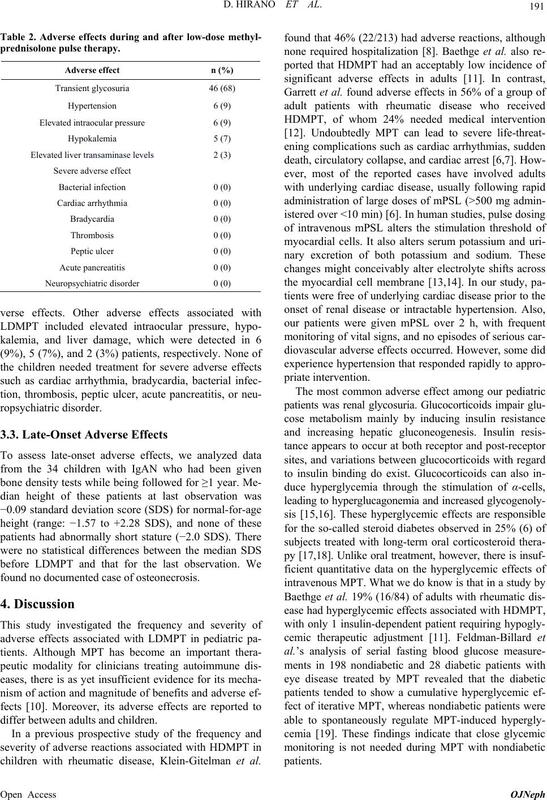 M. Ohya, H. Otani, Y. Minami, S. Yamanaka, T. Mima, S.
Patients,” Clinical Nephrology, Vol. 80, No. 1, 2013, pp. 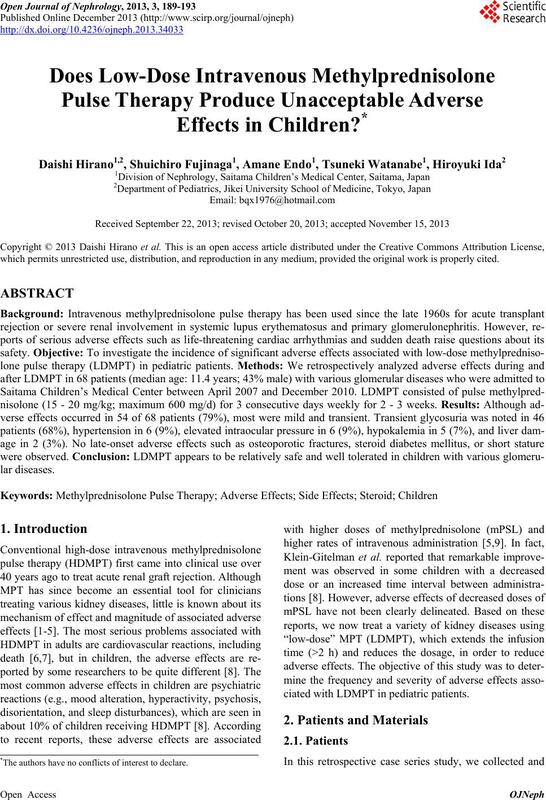 with Glomerulonephritis,” Internal Medicine Journal, Vol. 42, No. 12, 2012, pp. 1363-1365. Vol. 23, No. 12, 1989, pp. 1019-1023. Transplantation Proceedings, Vol. 8, No. 3, 1976, pp. gy, Vol. 25, No. 10, 1998, pp. 1995-2002. “The Boston Collaborative Drug Surveillance Program. No. 5, 1972, pp. 694-698. Diseases, Vol. 49, No. 4, 1990, pp. 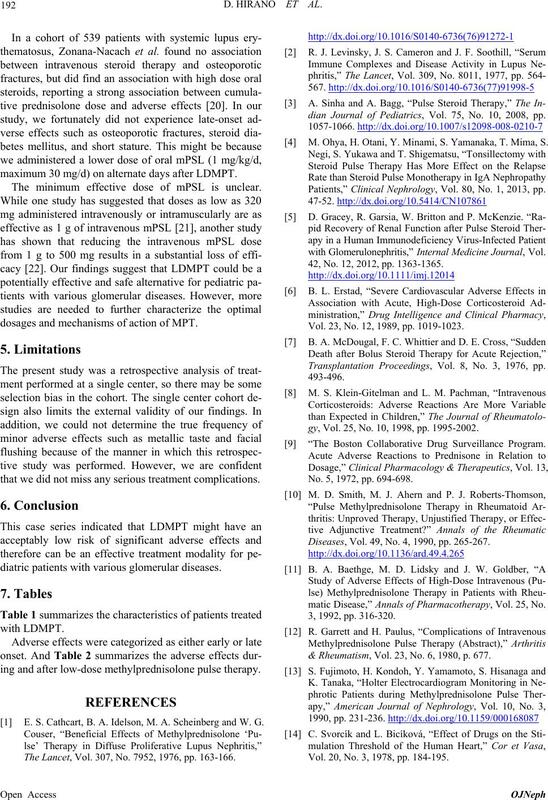 265-267.
matic Disease,” Annals of Pharmacotherapy, Vol. 25, No. & Rheumatism, Vol. 23, No. 6, 1980, p. 677. Vol. 20, No. 3, 1978, pp. 184-195. G. Pagano, P. Cavallo-Perin, M. Cassader, A. Bruno, A.
jects,” The Journal of Clinical Investigation, Vol. 72, No. tabolism Reviews, Vol. 4, No. 1, 1988, pp. 17-30. J. H. Gurwitz, R. L. Bohn, R. J. Glynn, M. Monane, H.
Medicine, Vol. 154, No. 1, 1994, pp. 97-101. Therapy in Eye Disease,” Ophthalmology, Vol. 110, No. Vol. 43, No. 8, 2000, pp. 1801-1808. Vol. 15, No. 2, 1998, pp. 242-246. M. E. Shipley, P. A. Bacon, H. Berry, B. L. Hazleman, R.
ogy, Vol. 27, No. 3, 1988, pp. 211-214.